In general, I am interested in the environmental conditions that influence the abundance and distribution of animal (host) and parasite populations, neither of which are independent from the other. I integrate laboratory experiments, field studies, GIS, and population genomics to better understand population patterns in nature. Parasitism is a symbiotic cost–benefit relationship between two species where one species (i.e., the parasite) must live within-or-on the other species (i.e., the host) in order complete its life cycle. Parasites, including organism that are parasitic for at least one stage in their life cycle, are estimated to make up half of the species on Earth, and can exhibit greater biomass than vertebrate predators in some ecosystems. As a result, parasitism is thought to affect the life history of nearly every known organism. My Ph.D. explored environmental effects (natural and anthropogenic) on host–parasite interactions. My first aim was to understand how atrazine, a commonly used herbicide, affected hosts, parasites, parasite transmission, and host–parasite interactions (including interactive effects of atrazine and parasitism on hosts, the production of parasites from hosts, and parasite infectivity to hosts). The second part of my dissertation focuses on natural environmental effects on hosts, parasites, and host–parasite interactions, including the effects of habitat on host morphology, parasite distributions, and parasite-induced morphologies. Amphibians are excellent models for studying parasite transmission because they spend some of their life in aquatic habitats and some of their life in terrestrial habitats. Thus, they encounter a variety of different parasitic organisms with diverse life-cycle strategies. They also serve as second intermediate hosts for birds, fish, reptiles, mammals, and even other amphibians. My thesis focused on the temporal and spatial ecology of amphibian populations and their parasites. I was born and raised in the small town of Perham, Minnesota, where I developed an interest in the wildlife of forests, lakes, and wetlands. 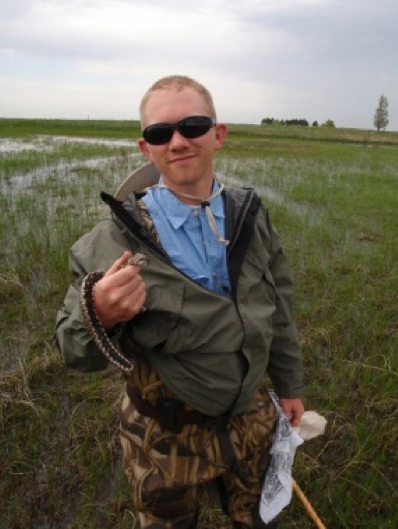 I attended the University of North Dakota for my Bachelor of Science degree majoring in Wildlife Biology and for my Masters of Science degree in Biology. My undergraduate research focused on temporal changes in amphibian parasite communities and my graduate research focused on the spatial ecology of amphibians and their parasites. I then attended Oklahoma State University for my Ph.D. in Zoology where I studied the transmission ecology of trematodes, and environmental effects on host–parasite interactions. I am now a post-doctoral researcher in the Ernest Laboratory of Wildlife Genomics and Disease Ecology at the University of Wyoming where I work on mountain lion population genomics and molecular mark recapture. When not working, you won’t be able to find me because I like to spend my time camping and rock climbing in remote locations.